Join Ellen Goldberg and Hugo Rivera, of Meadmore Studios LLC, and Jonathan Lippincott, author of Large Scale, for a gallery talk in conjunction with our current exhibition, Clement Meadmore: The Models. Lippincott will place Meadmore’s work in the context of his contemporaries and will talk about the artist’s deep involvement in the process of making the large-scale works. He will be joined by Goldberg and Rivera for an informal conversation about the artist, his love of jazz, and his legacy. A reception follows. 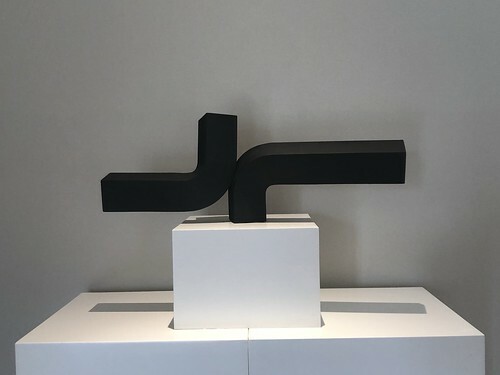 Ellen Goldberg is the trustee of the Clement Meadmore Foundation that was set up on Clement Meadmore’s death, and the president of Meadmore Sculptures LLC. She and Meadmore met in 1969 when they worked together on designs at Kulicke Frames in New York. When Meadmore was diagnosed with Parkinson’s disease, Goldberg took over the management of Meadmore Sculptures and helped the artist with his galleries and exhibitions. Since Meadmore’s death, all the profits from the sale of sculptures has gone to needy jazz musicians. A total of one million dollars has been given to multiple organizations and institutions of higher education: to the Jazz Foundation of America and through them to the Dizzy Gillespie Memorial Fund at Englewood Hospital in New Jersey; to the Juilliard School of Music and the Manhattan School of Music to endow scholarships; and to Oberlin, the New School, and Rutgers University. Hugo Rivera is the field manager for Meadmore Studios LLC and is responsible for approving all sculptures that are fabricated or restored. He worked with Meadmore in his studio loft apartment and with the fabricators who made the sculptures. Rivera also participated in the many shows featuring Meadmore’s work. Jonathan Lippincott studied studio art and art history at Swarthmore College, graduating in 1989. During the next few years, he worked at Haystack Mountain School of Crafts as a cook and handyman, at the Yale University Art Gallery as an art handler, and as a dessert baker in Providence, RI. He moved to New York City in 1993 to begin work in publishing, and a year later joined Farrar, Straus and Giroux, where he is now design manager. Since 2000 he has also worked independently as art director and designer on a range of illustrated books about architecture, landscape, and fine art. His primary client has been Library of American Landscape History, where he now also serves as assistant director. He is the author of Large Scale: Fabricating Sculpture in the 1960s and 1970s, and the recently published monograph, Robert Murray: Sculpture.